With an expanding awareness of the challenges of sustainability, featured more in the daily news than in higher education textbooks, scholars and faculty have been called to connect their syllabi to the ‘real world’. This book doesn’t just offer the ‘why’; it offers the ‘how’ through presenting the definition and model of the ‘sustainability mindset’ to help educators frame curricula to facilitate broad and deep systemic learning among current and future leaders. A sustainability mindset is intended to help individuals analyze complex management challenges and generate truly innovative solutions. The sustainability mindset breaks away from traditional management disciplinary silos by integrating management ethics, entrepreneurship, environmental studies, systems thinking, self-awareness and spirituality within the dimensional contexts of thinking (knowledge), being (values) and doing (competency). This book is aimed at professors, faculty members, instructors, teaching assistants, researchers and doctoral students in higher learning management education programs. Chapter contributors are all teaching professionals from programs around the world, who have been doing research and creating curricula, assessments, tools, and more for the students in their classes, and the book will be globally applicable. Developing Sustainability Mindset in Management Education is relevant to students, educators, administrators, and leaders worldwide. It is a thoughtful, insightful, and purposeful book that breaks away from the traditional academic silos to allow educators to teach using systems thinking, self-awareness, and spirituality. The various authors present a re-conceptualization of education philosophies and objectives, new ways of developing a sustainability mindset in management students, and an opportunity to bring students into alignment with the United Nations 2030 Sustainable Development Goals (SDGs). Over the last decade, business management has been involved in an active debate over several global problems facing humanity. At the center of the debate is the search for engaging leaders in the private sector to support the United Nations' Sustainable Development Goals and The United Nations' Principles for Responsible Management Education. Key to success in this direction is opening the mindset of business leaders to a holistic global view. 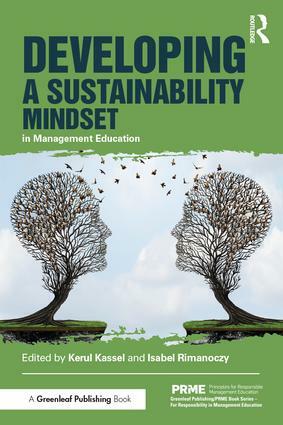 Developing Sustainability Mindset in Management Education, edited by two visionary researchers, focuses on the essential factor of developing this weltanschauung or world vision mindset and offers both theoretical and practical methods. A remarkable collection of articles by like-minded and engaged researchers from around the world to help prepare leaders for dealing with common problems. The book calls for holistic approach to management education that simultaneously addresses the "heads, hands and hearts" of future business leaders and the organizations they will create and/or work for. It also provides evidence and inspirational stories on how the possibility of developing the specific logos, pathos and ethos of sustainable mindset for the new role of business in society, sustainable development and responsible leadership could be turned into reality, both inside and outside the classroom. Milenko Gudic, Co-chair PRME Working Group on Poverty, a Challenge for Management Education. Developing "The Sustainability Mindset", what an important idea! We, as a species, are in urgent need of learning for sustainability in order to become native again on this planet. Holistic educational approaches like the ones promoted by this book- learning to know, to do and to be- have enormous potential to foster such learning. If business education intends to foster global prosperity, then we must be more purposeful about developing the values, attitudes, and beliefs of our students. This book is about doing that. It informs and inspires by drawing on the ideas and experiences of pioneering professors from more than a dozen countries. Kerul Kassel is faculty at Fielding Graduate University, author of The Thinking Executive’s Guide to Sustainability (Business Expert Press, 2014) and has been awarded year-on-year fellowships at Fielding’s Institute for Social Innovation. Her work has appeared in peer-reviewed journals and conferences around the world. Isabel Rimanoczy is Convener of the PRME Working Group on the Sustainability Mindset and author of Big Bang Being: Developing the Sustainability Mindset (2014) and Stop Teaching (2016). She is a Fellow of the Schumacher Institute and a Strategic Sustainability Adviser with One Planet Environmental Network. The PRME initiative has more than 600 signatories worldwide. Alongside encouraging new institutions to sign up to the initiative, volumes within the PRME book series aim to cultivate and inspire actively engaged participants by offering practical examples and case studies to support the implementation of the Six Principles of PRME. Books in the series aim to enable participants to transition from a global learning community to an action community.